NTS Lightning Technologies provides engineering consulting and testing services related to lightning's direct and indirect effects in various industries, including aerospace and wind energy. We have vast amounts of experience with lightning, protection from it, and its related electromagnetic interference (EMI) effects. Our engineering consulting services capture the entire development process, from design to certification, for lightning safety. Our consulting services include the use of finite element method (FEM) modeling using COMSOL Multiphysics® to help evaluate design parameters and determine test levels for certification. Data generated from our models is also supported with test data performed at our facility. Below is a list of our highlighted projects using COMSOL Multiphysics®. 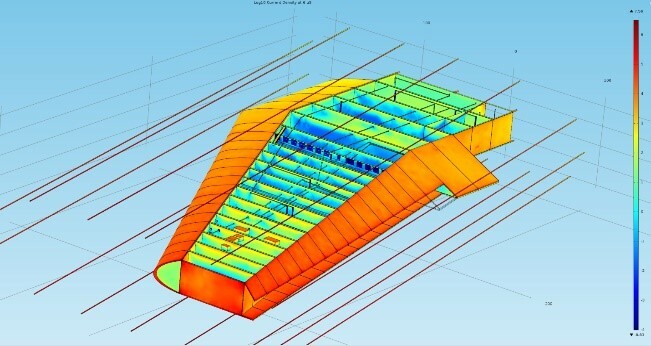 We developed a COMSOL Multiphysics® model to simulate a lightning strike on the tip of an airplane wing. This was done to evaluate the risks of ignition sources in the fuel tank. Currents and voltages were probed throughout the model and were used as test levels for certification. Airplane wing with a surface plot of the current density. We simulated lightning currents conducting through a 65-meter wind turbine blade with a thin surface protection layer (SPL) as well as anisotropic carbon pultrusions and electric thermal heaters that follow the length of the SPL. Electric fields were probed in the model to determine the risk of sparks between the carbon and SPL. Currents were measured to determine the amount of current flowing through the surge protection devices. Model geometry of the 65-m wind turbine blade.